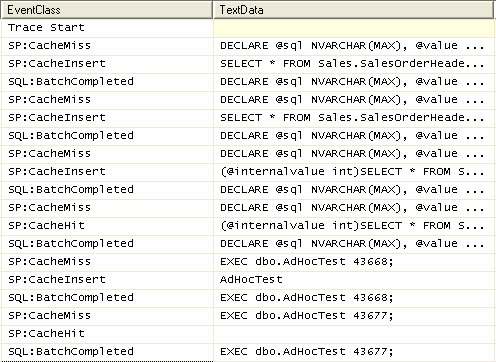 There’s a very common belief among DBA’s: Stored procedures are pre-compiled. I had someone tell me all about it just last week. There are lots of sources that say what I’m getting ready to say, so this really shouldn’t come as news to anyone,but it will. No, they’re not. Stored procedures are not pre-compiled. When you create or update a stored procedure on the server, it gets a syntax check. But there is no compile process, let alone a pre-compile process. That stored procedure exists exactly as it is named, a procedure that is stored on the server. It’s just a collection of TSQL code, possibly with some parameters, waiting to be called. Until it’s called, it is not ready to be executed. Don’t believe me? I’m not a huge sports fan (except for MMA), but I’m willing to use a common sports expression. Let’s go to the slow motion instant replay, also known as trace events. With the first statement to create the procedure, you see that there was a CacheMiss event, since the DDL statement isn’t cached. You’ll get a miss event every time this runs. Next, the execute statement runs and you can see another CacheMiss event followed immediately by a CacheInsert event. This is the creation of the execution plan and it’s addition to the cache. The statement completes and the second execute statement fires. This gets a CacheHit event, since the last execute created a plan, and then it completes. The final statement, again, DDL, so you see a CacheMiss event and then the CacheRemove event as the procedure is dropped. Nothing was added to the cache until the procedure was called. There was no pre-compile process. None. To quote a popular television show, myth busted.